“On, Wisconsin!” turns one hundred. Badgers everywhere know the tune instantly. “On, Wisconsin!” evokes memories of dancing precariously in the student section, blasting music from car stereos at tailgate parties, sweet victories, and painful losses. 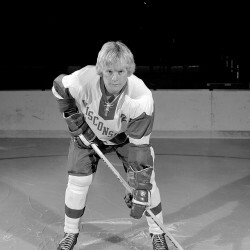 Purdy had intended to enter the tune in a contest for a new University of Minnesota fight song. 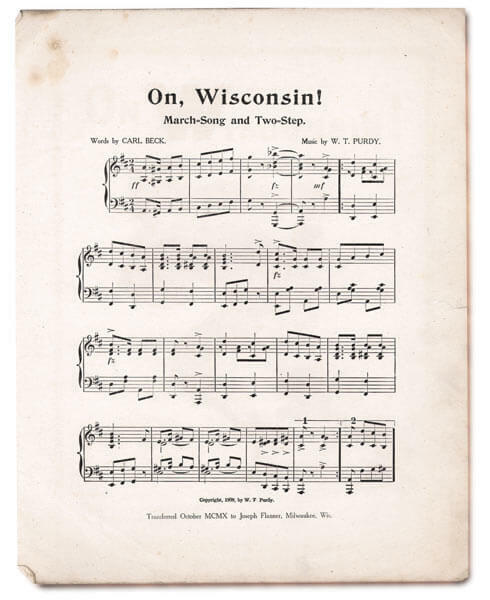 The first line would have been “MINN-e-so-ta, MINN-e-so-ta.” Carl Beck, a former UW student and Purdy’s roommate in a Chicago boarding house, encouraged him to dedicate it to the Badger football team instead and contributed new lyrics. 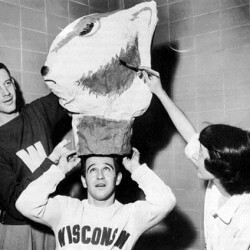 “On, Wisconsin!” is featured in the Beach Boys’ 1963 hit song, “Be True to Your School,” but it’s a tribute to the Wilson brothers’ alma mater, Hawthorne High School, whose fight song uses the same melody. An instrumental version of the song was used during a fight scene in the 1973 Disney animated film Robin Hood. Friar Tuck, portrayed as a badger, is cheering loudly. Contrary to a persistent rumor that resurfaced after his death, Michael Jackson did not own the rights to “On, Wisconsin!” — at least in the United States. The song is in the public domain, and it has been adopted by thousands of high school bands and at least eighteen other colleges. UW officials aren’t certain if Jackson, or anyone else, owned the international rights. To watch — and hear — videos or to upload your own, visit http://onwisconsin.wisc.edu. 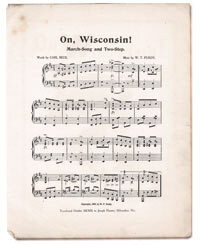 To learn more about the song’s history, visit http://archives.library.wisc.edu/uw-archives/exhibits/onwisconsin/. To shop for The Red Shirt, a limited line of T-shirts developed by the Wisconsin Alumni Association to support the UW Foundation’s Great People Scholarship Campaign, visit uwalumni.com/TheRedShirt.